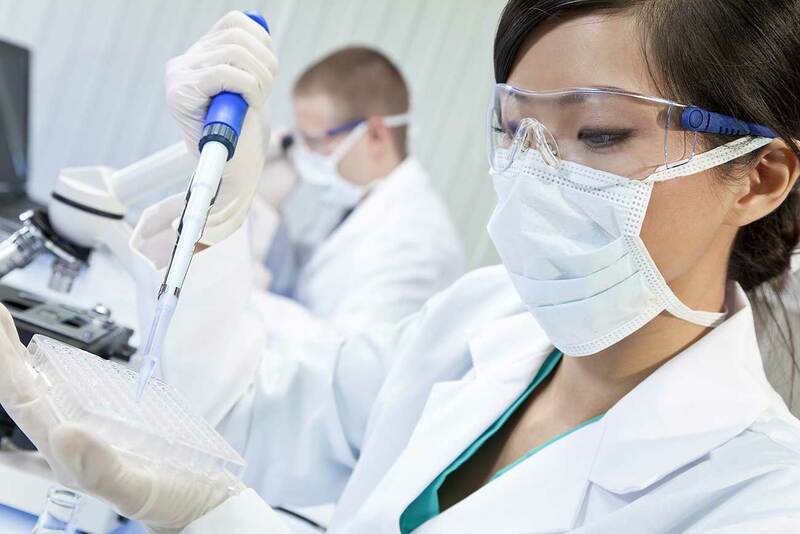 With our Clinical Discovery Research Reagents (CDRR) we want to help clinical researchers advance their clinical discovery. Our recently expanded portfolio of antibodies and bright fluorescent dyes enables BD to offer a broad selection of kits to advance your clinical research needs. BD Horizon™ Dri Leukocytes are dried lysed whole blood control cells that can be used as positive, negative and procedural controls in a variety of flow cytometric applications. Package: The kit includes 1 pouch of 5 tubes and 1 vial of reconstitution buffer. Table 1.175+ Surface Markers Expressed on BD Horizon Dri Leukocytes 175+ surface markers were expressed on BD Horizon Dri Leukocytes. 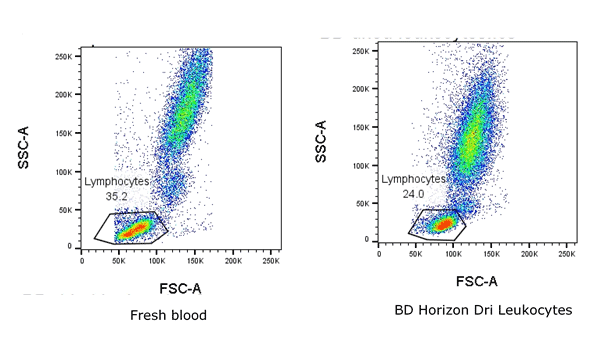 BD Horizon Dri Leukocytes were stained with 240 human cell surface markers using BD Lyoplate™ screening panels (Cat. No. 560747). The screening was carried out with the automated BD™ High Throughput Sampler on the BD FACSCanto™ system or the BD FACS™ Universal Loader on BD FACSLyric™ systems using the manufacturer’s suggested screening protocol. The data was analyzed using BD FACSDiva™, BD FACSuite™ or FlowJo® software. 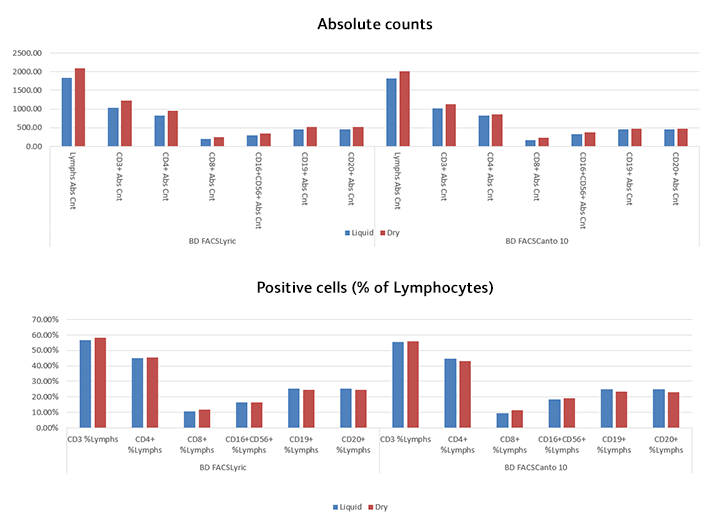 The analysis suggest that more than 175 surface markers are consistently expressed on BD Horizon Dri Leukocytes. And the list of markers is expanding as more markers are screened across multiple lots of BD Horizon Dri Leukocytes. BD Horizon Dri Leukocytes should be at stored at 2°C to 8°C. They should not be frozen. Protect the tubes from exposure to humidity during storage and protect from light during and after staining. The cells and reconstitution buffer are stable until the expiration date shown on the labels when stored as directed. Do not use after the expiration date. Due to the moisture sensitivity of BD Horizon Dri Leukocytes, ensure the pouch is immediately and completely resealed after removing a tube. Do not remove the desiccant from the pouch. Equilibrate the pouch to room temperature for 5 minutes before opening. Remove the desired tubes from pouch and immediately reseal the pouch for long-term storage at 2–8°C. 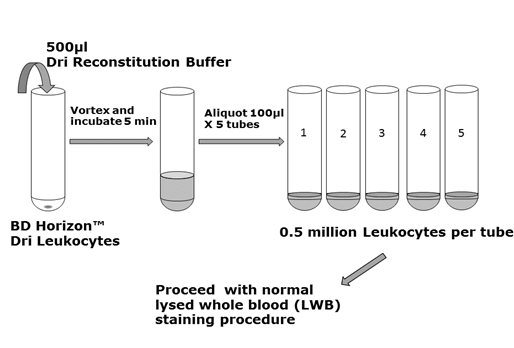 Add 500 µL of BD Horizon Dri Leukocyte reconstitution buffer to one tube. Vortex gently to mix. Note: Each tube contains 5 tests. 100 µL re-suspended cells per test is recommended. Add the appropriate volume of staining reagent to each tube, vortex and incubate in the dark for 20 to 30 minutes at room temperature. Add 2 mL of 1X PBS wash buffer to the tube. Vortex to mix. Centrifuge for 5 minutes at 300–500 g.
Aspirate the supernatant and re-suspend stained cells in 400 µL of 1% paraformaldehyde (PFA). Acquire immediately or store at 2–8°C and acquire within 24 hours of staining. Visit our website www.bdbiosciences.com/reagents or contact your local BD representative for a comprehensive list of cellular and intracellular markers tested, or specific staining procedures. This product is made from normal whole human blood cells. The blood used in preparation of this product is tested and found to be negative for human immunodeficiency virus (HIV) type 1 and type 2, and the hepatitis B and hepatitis C viruses. This product contains the preservative ProClin™. All biological specimens are considered biohazards. Handle as if capable of transmitting infection and dispose of with proper precautions in accordance with federal, state and local regulations. Never pipette by mouth. Wear suitable protective clothing, eyewear and gloves. BD Horizon™ Dri TBNK+CD20 is a dried reagent panel comprising the same conjugates that are in the BD Multitest™ 6-color TBNK reagent with the addition of CD20 V450. 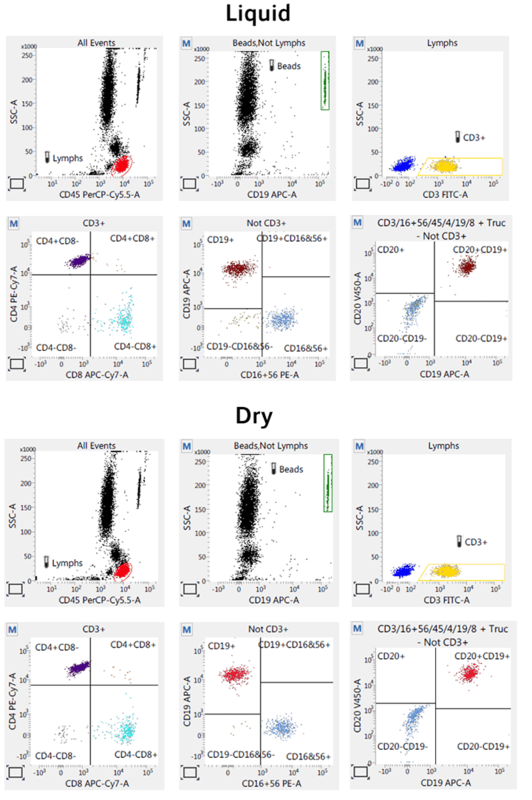 Flow cytometric analysis was performed on whole blood stained using either the BD Multitest™ 6- color TBNK reagent with a CD20 V450 drop-in (Figure 1A) or BD Horizon Dri TBNK+CD20 tube (Figure 1B). Laser excitation was at 405 nm, 488 nm, or 635 nm. Stained samples (using BD Multitest 6-color TBNK reagent with a CD20 V450 drop-in and BD Horizon Dri TBNK+CD20 tubes) prepared using three donors were transferred to BD Trucount™ tubes, acquired using the BD FACSLyric™ or BD FACSCanto™ systems and analyzed for determination of absolute counts of lymphocytes in blood (Figures 2A and 2B). Store tubes in their original foil pouch at 2-27°C. Do not freeze the reagent or expose it to direct light at any time during storage or incubation with cells. Once the pouch is opened, use the remaining tubes within one month (when stored as directed). Do not use reagents beyond the expiration date indicated on the label. CAUTION: Due to the moisture sensitivity of the reagent, ensure the pouch is immediately and completely resealed after removing a tube. Do not remove the desiccant from the reagent pouch. Refer to our website or contact your local BD representative for the lyse/no-wash protocol for direct immunofluorescence. Use aseptic blood collected in EDTA (ethylenediamine-tetraacetic acid) blood collection tubes. Add 50 μl of well-mixed, anticoagulated whole blood in to the bottom of the air-dried reagent cocktail tube and mix to complete reconstitution by gentle pipetting/vortexing for four seconds. Incubate 15 minutes at room temperature. Protect from exposure to direct light. Add 450 μl of 1X BD FACS™ lysing solution to the tube. Vortex to mix. Incubate for 15 minutes in the dark at room temperature. The sample is analyzed on a flow cytometer with a setup optimized for antibody panels. To support you, we have prepared support protocols and posters. Follow the “More information” button below to access these documents.